A group of lucky Malaysian divers enjoyed an unexpected encounter with a pod of Pygmy Killer Whales in Gorontalo’s deep blue waters. After a day of great diving on November 28th, we were heading back to our dock. Miguel’s Diving staff spotted a group of dorsal fins in the waters ahead of the dive boat. The cetaceans quickly began leaping and swimming in front of our speed boat. So, everyone assumed they were dolphins. Here in Gorontalo we see both Bottlenose and Risso’s dolphins. Happily, Mrs. Tan Peck Sim had her cell phone ready to record. She is co-owner of Scuba Symphony in Kuala Lumpur. She and her husband were on their third dive trip to Gorontalo with a group of friends. Watch her video on our Facebook page. Our experienced dive staff were sure that those playful friends were not dolphins. So, we sent the video link to Dr. Benjamin Kahn. He is director of APEX Environmental’s Coral Triangle Oceanic Cetacean Program. That means he researches marine mammals like dolphins, porpoises and whales. 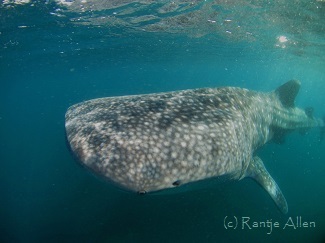 Miguel’s Diving has been sending him reports of whale encounters in Gorontalo. Read news of our first report ten years ago. Based on this consultation, Miguel’s Diving has determined that that we had a rare encounter with Pygmy Killer Whales. This is not our first encounter with this marine mammal. In 2009 a single Pygmy Killer Whale beached itself in Olele Village. Locals and Miguel’s Diving staff tried to turn the whale back to sea. The picture in this blog was taken during the attempted rescue. However, it had numerous wounds from cutter sharks and did not survive. The dramatic photo on our Submerged Point Diving page of the whale surfacing at sunset was from that sad encounter. Pygmy Killer Whales love deep, warm waters in tropical locations worldwide. They are rarely seen, except near oceanic islands. However, whales passing Gorontalo seem to ignore the big land mass of Sulawesi because the seas here are so deep. Waters off Olele Village plunge below four kilometers. Along the same route taken those Pygmy Killer Whales, we have seen pods of False Killer Whales and Melon-headed Whales in other years. Maybe we have discovered a whale highway! Pygmy Killer Whales (Feresa attenuata) can grow to a length of two to less than three meters. Size is the main reason that they can be confused with dolphins. However, their head is rounded with no beak or nose. They also have a distinct, dark cape with grey sides and a white patch on their belly. Their lips and chin are often white. They can have scarring around their head. One of the whales we saw clearly had the scarring and the white marks. They are also lively swimmers, as you can see from Peck Sim’s video. Indonesia’s most famous wreck is undoubtedly the Liberty Wreck in Tulamben, Bali. For those diving Sulawesi, there are few options for those who wish to dive wrecks. However, Miguel’s Diving has discovered several wrecks over the years in Gorontalo waters. The Tjenderawashi was a dredging barge. It overturned in a storm in 1993. In 2004 Miguel’s Diving staff measured and drew a map of this wreck. Take a look at the map on our Wreck Diving page. The map will appear among the images that scroll across the screen. Imagine what the wreck looked like a decade ago.To read more about Diving Sulawesi’s Tjenderawashi Barge Wreck, scroll down to read a description of the wreck. A brief history is included. Find out why so many metal drums are hanging from the sides of the wreck and scattered along the ocean slope. Have you discovered how we know it is named Tjenderawashi? Before you come diving Sulawesi’s hidden paradise in Gorontalo, read the Virtual Dive section. It will give you an idea of what to expect diving the Tjenderawashi Barge Wreck. You can locate the wreck on Teresa Zubi’s map of Gorontalo dive sites. Her site and its recommendations are a must for those diving Sulawesi. Since we first discovered this wreck, some changes have occurred. Coral growth has increased dramatically. A colony of branching Acropora coral thrives at the base of the crane tower. Storms and the corroding effects of salt water have opened up some sections not previously visible. Some of the drums have since fallen. That means the wreck’s appearance is still changing with time. The dramatic photo of this wreck was taken by Pak Suhodo Kartarahardja earlier this month. The shot actually looks through the remains of one hanging metal drum. When you are diving Sulawesi, be sure to make time to dive in Gorontalo and explore this fascinating wreck. Despite being busy with divers, Miguel’s Diving also receives requests to help in scientific research projects. We are assisting in a coral analysis research project on the hard coral colonies living in Gorontalo. The coral analysis project began earlier in the year profiling the coral composition of the reef using measurement tape. We just sent underwater photos and samples of 30 hard corals to the researcher at Universitas Gadja Madah in Yogyakarta, Indonesia. Rather than damage the lovely hard corals found in Gorontalo reefs, we picked through patches of coral rubble to match the type the research wanted. In Gorontalo seasonal storms break some sections of coral colonies, which collect in certain troughs. These areas of rubble are natural and not the result of negative human actions. Rubble areas here are in fact home to specific types of marine life, such as Fairy and Flasher wrasses. Best wishes to Mas Akbar Reza on his coral analysis research project! Thysanostoma jellyfish has a new discovery found only in Indonesian waters. In addition to leading great dives, Miguel’s Diving also assists in scientific research. Mr. Wyatt Patry of Monterey Bay Aquarium confirmed that a beautiful Thysanostoma jellyfish we spotted at the end of a dive is a new species. We call it the Lavender Tiger Jellyfish. Only two other locations in Indonesia report seeing it. For that reason,it is a very rare species of jellyfish from the genus Thysanostoma. The unique features of this jellyfish are the tiger stripes on the bell and the lavender color. Furthermore, Mr. Patry also says that it lacks zooxanthellae algae, which are present in other species ofThysanostoma. The dramatic photo is courtesy of Kaufik Anril. Large Thysanostoma jellyfish live in warm waters from the central Indo-Pacific to Japan. The Latin word thysanura means “bristle tails.” This name refers to the large, bushy oral arms that hang from the jellyfish’s central bell. Miguel’s Diving staff and guests occasionally see other species in Gorontalo, such as Thysanostoma thysanura. However, we have only see this type of jellyfish near the surface. Adult jellyfish are called medusa. They have a soft body consisting of a bell with tentacles or oral arms surrounding a central mouth. Solitary medusa, like Thysanostoma jellyfish, swim freely in the open ocean. Jellyfish are most famous for the stinging cells contained in their tentacles. The stinging cells are called nematocysts. They are microscopic and sensitive to pressure. Even a causal touch triggers hundreds or thousands of nematocysts. They fire like darts. As a result, jellyfish use them to immobilize prey like small fish. Moreover, some jellyfish are considered dangerous to humans. We have never seen any of these in Gorontalo. Happily for divers, Thysanostoma jellfish typically lack those stinging cells. Additionally, they are large and easy to avoid. Since this jellyfish is rare, only a few lucky divers will ever see one. For your chance to see unusual marine life in Gorontalo, please book your dive trip with us. Our Facebook page Miguel's Facebook Diving Gorontalo has now collected over 10,000 likes worldwide from scuba divers and underwater photographers and their friends. Thanks to our many fans of the Facebook Diving Gorontalo page! After her recent diving trip to Gorontalo, Teresa Zubi has updated her Gorontalo Sulawesi diving page. Based on years of diving experience, her Sulawesi profiles are a must for both serious and new divers looking for an evaluation of diving these great locations. This month Miguel’s Diving staff discovered the whereabouts of one of Indonesia’s uncommon endemic fishes, the Bath’s combtooth blenny. These cute fish are only found in the southern Indonesian islands from Bali to Flores. Males have a checkered red patterning and are rarely seen. The photo of a female is courtesy of Teresa Zubi.